Kale is a delicious and extremely nutritious vegetable that is gaining popularity right now. 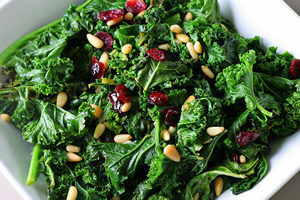 Kale, also known as borecole, is one of the healthiest vegetables you can eat. It belongs to the Brassica family that includes cruciferous vegetables such as cabbage, collards, broccoli, and Brussels sprouts. As a leafy green vegetable, it is available in curly, ornamental, or dinosaurvarieties. Kale’s colors can vary from green to purple to red. Kale’s health benefits come from its fiber content and high concentration and excellent sources of disease fighting antioxidant vitamins like A, C, and K. Kale contains the antioxidants carotenoids and flavonoids and is also rich in the eye-health promoting lutein and zeaxanthin compounds. Nutritionally, one cup of kale contains 36 calories, 0 grams of fat, 5 grams of fiber, and 15% of the daily requirement of calcium and vitamin B6 (pyridoxine), 40% of magnesium, 180% of vitamin A, 200% of vitamin C, and 1,020% of vitamin K. It is also a good source of minerals potassium, copper, high in iron, manganese, and phosphorus. One cup of kale is filled with 10% of the RDA of omega-3 fatty acids, which makes it a great anti-inflammatory food. Kale can be eaten cooked or raw. When choosing fresh kale, look for firm, deeply colored leaves with hardy stems. If you choose smaller leaves they will be more tender and milder in flavor. For the best storage of kale, store unwashed, in an air-tight zipped plastic bag for up to five days in the refrigerator. Prepare kale pesto, then add to pasta, an omelet or homemade pizza. Make a simple salad with a bunch of thinly sliced kale, red pepper, onion, carrots and your favorite salad dressing. Make kale chips – by slicing kale into bite-size pieces, toss with a drizzle of olive oil and a pinch of salt, and bake for 10-15 minutes at 350 degrees in the oven. This healthy treat is better than popcorn or potato chips. Sauté kale with olive oil, onions and garlic and serve as a side dish. Braise chopped kale and apples, garnish with chopped walnuts, and add a little balsamic vinegar. Substitute raw kale for raw cabbage to make kale slaw. Substitute spinach quiche for kale quiche. Toss whole-grain pasta with chopped kale, pine nuts, feta cheese, and some olive oil. Add kale to macaroni and cheese dishes too. With your own juicer, mix kale with apples, carrots, and a little lemon for an amazing kale juice. Try kale soup by adding kale with white beans and lean sausage, or use instead acorn squash and kale to create a sweet delicious soup.